True Blue processes blueberries and cranberries for the frozen and fresh markets. True Blue approached T3 about changing the Produce Scan system to allow for custom grading of blueberries and cranberries. They wanted a better way to manage their frozen inventory at multiple cold storages based on the grade of the product. These warehouses are offsite, outside facilities to True Blue. Grading and inventory were all maintained on paper up until this point. One of the problems with this was when product was graded, it was up to an employee to calculate this information and that had potential for human error. When it came to inventory management it meant that when a client needed to purchase a specific grade of product and number of unit’s, employees would have to search through the paper work, find where the product was, and make sure they had enough. At that time, they would contact the cold storage and have the product shipped. T3 added a new packing screen to allow the user to grade the blueberries and cranberries based off the samples taken by True Blue QC personnel. 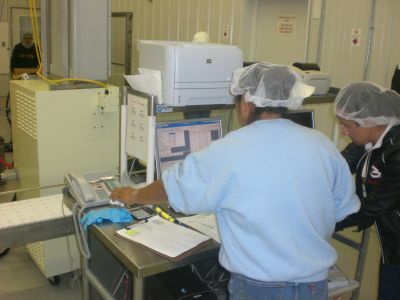 The employee enters in the sample tests and Produce Scan then grades the product based off the specs entered into the system from Grade A to Juice. The user can then tie the product to a contract from a buyer based off this spec. Once the product has been graded, the labels are printed, and the product is put into inventory. This inventory is moved to the storage facility. A report was added that allows True Blue to query their inventory by the grade and pack styles. This report allows True Blue employees to assign the product to a certain client as well as find out where it is being stored. This system also gives them an accurate, real time inventory available to be sold. Because they no longer need to search through paperwork to find their pallets for shipping, this new solution has saved True Blue hundreds of man-hours per year. It has also increased speed and accuracy in the paying of their suppliers, based on pack out of the received inventory from those suppliers.